The Federal Bureau of Investigation and the U.S. Department of Justice will review the case involving "Empire" actor Jussie Smollett, President Donald Trump tweeted early Thursday. Lauren Petty reports. The Federal Bureau of Investigation and the U.S. Department of Justice will review the case involving "Empire" actor Jussie Smollett, President Donald Trump tweeted early Thursday. "FBI & DOJ to review the outrageous Jussie Smollett case in Chicago. It is an embarrassment to our Nation!" Trump tweeted at 6:34 a.m. CST. Both the FBI and the Department of Justice declined to comment on the case Thursday morning, according to NBC News. All criminal charges against Smollett were dropped Tuesday, nearly two months after the actor was accused of orchestrating a hate crime attack on himself. The surprise decision to dismiss the charges was celebrated by Smollett and his legal team and blasted by Chicago's mayor and police department, who raised questions about the circumstances of the deal. In an appearance on "Today" Thursday, Smollett's attorney Tina Glandian said his legal team was "not at all" concerned about a potential FBI investigation into the circumstances surrounding the dismissal of charges. "We have nothing to be concerned about because there was nothing on our end to request this, to do anything improper, and to my knowledge, nothing improper was done," Glandian said. 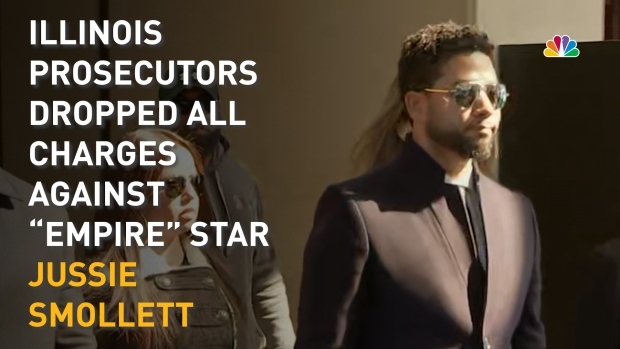 The news that charges would be dismissed came during an "emergency court appearance" where prosecutors not only dropped the charges against Smollett but agreed to expunge the actor's record. Prosecutors later said the charges were dismissed in exchange for Smollett's forfeiture of his $10,000 bond and his performance of community service. Smollett pleaded not guilty to multiple disorderly conduct charges earlier this month. He was initially charged with one felony count of disorderly conduct in filing a false police report in February, with Chicago police alleging that he staged the attack the month before because he was "dissatisfied with his salary." A Cook County grand jury then indicted Smollett on 16 felony counts. "Jussie was attacked by two people he was unable to identify on January 29th. He was a victim who was vilified and made to appear as a perpetrator as a result of false and inappropriate remarks made to the public causing an inappropriate rush to judgment," Smollett's attorneys Glandian and Patricia Brown Holmes said in a statement. Smollett maintained his innocence, saying after court that he has been "truthful and consistent on every single level since day one." Cook County prosecutors abruptly dropped all charges against 'Empire' star Jussie Smollett in a stunning development. Prosecutors charged Smollett with filing a false police report following an alleged racist and homophobic attack by two men late January. Smollett reported the alleged attack to police on Jan. 29, claiming to have been beaten by two men who shouted racist and homophobic slurs, beat him, put a noose around his neck, and poured bleach on him, according to the indictment. Initially investigating the incident as a possible hate crime, Chicago police said new information "shifted" their approach to the case, leading them to allege that Smollett orchestrated the assault by hiring two brothers who worked on "Empire" to execute it. Chicago Mayor Rahm Emanuel and Police Supt. Eddie Johnson hammered the decision to dismiss charges against him, saying they were unaware it was happening. "At the end of the day it's Mr. Smollett who committed this hoax. Period. If he wanted to clear his name the way to do that was in a court of law so that everyone could see the evidence," Johnson said. "I stand by the facts of what we produced. If they want to dispute those facts the place to do that is in court." Emanuel called the decision a "whitewash of justice." "Where is the accountability in the system? You cannot have because of a person’s position, one set of rules apply to them and another set of rules apply to everybody else," he said. Chicago Mayor Rahm Emanuel, appearing visibly angry, joins Chicago Police Supt. Eddie Johnson in a press conference reacting to news that all charges against "Empire" actor Jussie Smollett were dropped Tuesday. In response to Trump on Thursday, Emanuel said in a radio interview that he should "sit this one out," a spokesman for the mayor tweeted. In a statement, the Cook County State's Attorney’s office said the decision came “after reviewing all of the facts and circumstances of the case, including Mr. Smollet’s volunteer service in the community and agreement to forfeit his bond to the City of Chicago." "We believe this outcome is a just disposition and appropriate resolution to this case," the statement read. In an interview Wednesday, Cook County State's Attorney Kim Foxx defended her office's decision to drop charges and denied that she had any involvement after recusing herself from the case in February. "I did not want, as this investigation changed, for there to be any question about my impartiality so I removed myself," she said, echoing earlier statements from her office that the decision to drop charges was not uncommon in disorderly conduct cases. "Over the course of the last two years, we've had 5,700 people go through our pretrial diversion process, people who have non-violent offenses and who have no violence in their background," Foxx said. "And so I think when people see this one particular case it feels like an outlier where in fact, it's consistent with how we treat people charged with similar offenses with the same background." Jussie Smollett makes a statement after appearing in court where prosecutors dropped all charges against him. Documents obtained earlier this month via Freedom of Information Act request showed that Foxx had asked Johnson to turn the investigation over to the FBI. The documents also showed correspondence between Foxx, an unknown person and Tina Tchen, a one-time assistant to former President Barack Obama and Chief of Staff to Michelle Obama. "It was not unusual for me to talk to a victim in a case," Foxx said. "At the time that I engaged with this family member, Mr. Smollett was a victim." Tchen said in a statement she knew members of the Smollett family from "prior work together" and that "as a family friend," she contacted Foxx "to put the chief prosecutor in the case in touch with an alleged victim’s family who had concerns about how the investigation was being characterized in public."